Fellow Nevisians, citizens, friends at home and abroad, it gives me great pleasure to bring you greetings on the 31st Anniversary of our Independence. Today, we, as a Federation, have passed yet another milestone in our national sojourn, as we endeavour to tackle the difficult task of governing our nation, consolidating our economic welfare and ensuring social and political equality for all. As we reflect over these 31 years of Independence, we can feel a sense of accomplishment as the economic and physical development of our country has taken shape. There have been unfortunate glitches and even serious challenges which we hope will be overcome, as our people demonstrate resilience to withstand the threats of the external environment and the internal challenges caused by unbridled demands from our people and from the unfortunate antisocial behaviour. As a relatively young nation, we must manage these aspects of our development if we are to avoid future pitfalls. The lessons of the past 31 years must not be ignored. As a people, we must apply the wisdom of the ages even as we use modern technology and applications. We must seek to manage our national and private individual resources, using best practices and looking long term and not just for the expediency of short-term benefits. We must apply prudent policies to guide the way in which we govern our financial resources so that the burdens on our people are not excessive, even as we seek to provide and utilize social and developmental services to provide a better quality of life for all of our people. As a fledgling nation, we have faced and overcome numerous challenges in all areas of life. Even if not always with 100 percent success, we have always confronted the challenges, for example, of crime and violence, political partisanship and the erosion of family values with quiet confidence and realistic optimism. We have made significant strides to provide a remarkable quality of life for our citizens and residents. We have consistently pursued and achieved excellence in a range of human endeavours and when analysed, we have scored high on the indices of human development which include access to education at all levels and health services available to all. Our competent and careful management of our economy must be applauded, our fiscal prudence as well, as the reduction in our island’s debt demonstrates that we are capable of taking care of the affairs of our little island home, Nevis. Though we have much to celebrate, we must never become complacent. In recent times, we have added to our national burden with senseless crime and violence through the actions of a few misguided and delinquent minority, who persist in their unhealthy and unwarranted behavioural habits. Crime and violence tear at the very fabric of our society. It not only threatens our safety and the development of our economy, but our very way of life as we have come to know it. As Nevisians and citizens generally of this country we must take personal responsibility for our actions and show empathy for our neighbours and their children. We must protect the ailing and the vulnerable among us and care for the disabled and the weak as well. Above all, we must have respect for the gift of life. We must have respect one for another. 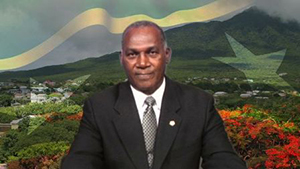 This is the Nevisian way of life and this we must never surrender to the perpetrators of crime and violence. In the midst of our celebrations, fellow citizens, fellow Nevisians, this year, we want to ask all of you Nevisians, citizens at home and abroad, to revisit and draw strength from the Nevisian ideals of hard work, perseverance and commitment. Such virtues will define us as we struggle against all odds and become victorious in the face of adversity. I call on all of us to recognise that we are still living in economically trying times. Each of us, therefore, has a role to play in displaying the national discipline required to see us through this testing period. As conscientious citizens, let us rearrange our priorities where and when necessary. Let us re-examine our preferences and taste as we stand together as a united people with a renewed sense of faith, hope and courage and battle through this ongoing global economic malaise. We can do it but we need to exercise resourcefulness and use our abilities to get us through. Our nation is small, resource challenged and vulnerable. If we are to survive, we must always remember that along with our rights, independence also conferred upon us the responsibility of setting high standards and never deviating from the pursuit of these standards. For us to achieve greatness as a country, we must insist on high standards in our homes, our schools, our work places and in every aspect of our lives. In so doing, we will continue to make boundless strides and progress as an island and as a nation, and as a Federation of St Kitts and Nevis. We must use the lessons and the experience of the past to ensure that our democracy and our institutions for governance are strengthened. We must ensure that as a people our pursuit of freedom and justice and prosperity for all is not abrogated and that we can live in peace and harmony seeking the greatest good for all, thereby ensuring that our independence means something for all of us as citizens no matter where we may reside. My fellow citizens, it is my firm belief that as an independent nation our best is yet to come. With your continued support, we will usher in a brighter day and a greater tomorrow. As we celebrate 31 years of Independence, let us do so still recognising that God is our defence and support and let us seek to put our country above self and above individual differences. May God continue to bless our nation that is on the move. May He give us 31 more years of progress. Happy 31st Anniversary of Independence!